Resting in the rolling Eastern Cape hills 80 kilometres outside Port Elizabeth, Bukela Lodge offers a gentle, tranquil escape from the world. The abundant Amakhala wildlife includes lion, cheetah, black and white rhino, elephant, giraffe, zebra and buffalo, ranging over a breath-taking oxbow river plain in the heart of the 7 500 hectare, malaria-free conservancy. Our intimate 5-star lodge offers an exclusive game viewing experience which, combined with our luxurious, secluded accommodation, creates a remarkable, private retreat in which to regenerate body and mind. booking enquiry no obligation! OR book now! "This place was one of our highlights: luxury tents, amazing views, good and plenty of food, very friendly staff taking care of us and truly amazing safari game drives. We loved the outdoor shower as..."
"we stayed at the BUKELA LODGE game reserve ,we booked the luxurious accommodation but decided to stay in the luxury tent as the view was better from out patio over looking the water hole where wiled..."
"My husband and I visited with friends in March 2019. It was the high light of our South African holiday. Fantastic experience. Extremely well organised. Game drives were amazing, food and..."
"Stunning location with luxurious tented accommodation, all furnished to a high standard. We had tent 9 which sits directly in front of a watering hole so enjoyed the daily visits from the animals and..."
"Awesame accomodattion but NO big five!!!" "We had a wonderful stay in a luxury tend that was amazing!!!!! Staff was very friendly, specially our ranger CV who answerd all of our questions with patience and humor! The safari was great, but we..."
"Superb time and experience . All the staff were excellent and very friendly. Accommodation was very good with super views . Food also lovely with good choice. Seen all the animals including Big Kholi..."
"Without exaggeration the three days we spent at Bukela lodge on the Amakhala were the most unforgettable holiday I have ever had in my sixty years. This was the final leg of a ten day break in South..."
"Staff and Rangers are knowledgeable and helpful. The accommodation is excellent and the views breathtaking. The game drives in the morning and afternoon are great and the rangers really helpful..."
"Stayed here for two nights, had a wonderful time. A luxurious resort in the middle of a well maintained and conservation focused nature reserve. Our ranger Andrew was so knowledgable and a truly..."
"My partner and I stayed here as part of our honeymoon. All staff are very welcoming and helpful throughout the stay. You will never be hungry at Bukela, fantastic food with very friendly and..."
"The perfect place to unwind and relax"
"Our stay at Bukela was luxurious. The staff were very attentive and friendly. The rooms are clean and cosy with lots of cute amenities. The atmosphere around the lodge is great, no matter what time..."
"First contact with Bukela resort was a bad start due to the inefficiency of their organization: no answer to a number of emails we have sent to them, in order to prepare our stay. We finally found..."
"This place is phenomenal. We had a "tent" 50 yards from the waterhole and we had all sorts of animals and birds visiting, day and night. The highlight was the time an elephant came right up to our..."
"animals comd to visit too!" "stayed here aspart of our tour, great place nice staff tasty food. Ty our game drive driver was very enthusiastic about the animals and the park, knew all the birds,trees, plants by name. great t o..."
"The staff were all helpful, friendly, attentive and the facilities inside and out were excellent. Food and service was very good. The game drives were well organised and as well the iconic game we..."
"5 Star luxury lodges, surroundings and staff. Made to feel welcome by all. Extremely knowledgeable rangers , all dedicated to the cause. An experience I will never forget, my only regret is not..."
"Our 2 night stay at Bukela was the highlight of our holiday in South Africa. The 4 game drives were amazing and our ranger was excellent. All the staff were very friendly and helpful. It was a really..."
"Excellent accommodation in individual lodges in the middle of the 8'000 ha reserve, full of wild animals. Respectful behavior towards these wild animals, which are walking around the..."
"An excellent lodge catering well for a dairy allergy"
"We were booked to stay in this lodge at the end of our first South Africa road trip. The reviews were good except for some negative comments about catering for allergies and as I have a dairy allergy..."
"Safari was amazing, we had 4 drives over our 2 night stay. Our guide Jonno was fantastic! Accommodation gorgeous and luxurious. We stayed in a luxury tent. Food is solid, some of it great, some..."
"Our two nights at Bukela afforded us a wonderful and memorable experience from the luxurious tent, glorious views, exciting game drives with our excellent and very informative guide Andrew where we..."
"Bukela Game Lodge was the perfect end to our honeymoon. The lodges were comfortable, had spectacular views and provided the perfect retreat to relax when not on a game drive. All staff were..."
"This is the most incredible place , the lodge is pure luxury, great staff , food excellent, the tent was just like a five star hotel room & the views were breathtaking, elephants, warthogs, monkeys..."
"I can't speak highly enough of this lodge. We arrived quite late in the afternoon and were worried that we might miss the evening game drive. We called ahead and the staff were very efficient when we..."
"Little piece of heaven but remember this is a Game Reserve so you will not get a "real" safari experience"
"My husband and I stayed here for three nights during our three week trip to SA in September, 2018 and found it to be a little piece of heaven. Unbeknown to me when we booked two people I know had..."
"Not all five stars are the same...!!" "We stayed here for three nights which was the final part of our South African adventure. The staff are welcoming and the accommodation tents are comfortable. Having never been on safari before we..."
"We stayed for 3 nights here. Warm welcome by staff, except they forgot to mention that we may not have water as the elephants had dug the pipe up! That afternoon and eve there was no water in the..."
"We stayed for 3 nights at Bukela and had a great time! The game drives were the highlight- we saw all sorts of animals and Ty's enthusiasm and information he shared with us was much appreciated. We..."
"Spent 3 nights here, marvellous guide/warden Ty very knowledgable and great sense of humour, abundance of wildlife to see. Drives at 6am and 4 pm with optional night drive available. Mixture of tents..."
"We stayed for 2 nights, leaving 25th Nov. The reserve is about an hour from Port Elizabeth and sign posted very well. After you sign in at the security gate it’s a 7km drive on a dirt track through..."
"good value for money. The only little weak point of not been exellent rated is the Dinner. There is potential to raise quality. but this is not a complaint, its only a challenging point for rhe..."
"Wonderful Hospitality with Incredible Safari"
"Our stay at the Bukela Game Lodge within the Amakhala Reserve was the highlight of our South Africa road trip and one of our best holiday experiences ever. From the moment we arrived the warm welcome..."
"Very nice place, but pricey"
"Spent one night with my wife. Getting there can be tricky if there is rain, because you can only reach the resort by dirt/gravel roads, which are a bit bumpy, but quite managable unless you are..."
"Amazing end to our holiday "
"We stayed here for 3 nights and what an experience it was. We were made to feel extremely welcome from the moment we arrived. Unfortunately I wasn’t well upon arrival and staff were very helpful in..."
"The staff and the game drives are what this place is about. We weren't totally enamoured with our room but the lounge and dining are beautiful and comfortable and the food was ok. The game drives..."
"We stayed for 3 nights at the end of our recent South African trip. Just wished at the time of booking this stay with Trailfinders they had encouraged us to stay longer. We just loved the whole..."
"Wonderful 3 night stay at Bukela"
"We loved our stay at Bukela. Our luxury tent was fantastic with woodburner, lovely bathroom and very spacious, comfortable bedroom and sitting area. We loved the breakfasts and excellent dinners in..."
"Oh dear what have they done to Bukela Lodge. We stayed here 2 year ago and there were just 4 chalet and 8 people it was so relaxing and we were able to unwind, meals were taken together the..."
"This is advertised as a 5 star hotel however the quality of service is definitely not 5 stars. Before arrival we were asked to notify the hotel of any dietary requirements and whether we were..."
"Above and beyond service, incredible facilities, great wildlife"
"My fiance and I visited to celebrate our engagement in September 2018 and stayed for 3 nights, the perfect amount of time and we were able to attend 6 game drives. Bukela Game Lodge is a convenient..."
"Safari - Lifetime Bucket List"
"Finally got to go on Safari, something that I've wanted to do for years! Bukela lodge is right beside the entrance to the wildlife reserve, so was handy to get to. They are really well organised and..."
"Perfect...although the drive in is a bit hairy!" "We stayed for 2 nights in one of the luxury tents. This was incredible, very large with a sitting area around a wood fire and a nice little bottle of port waiting on arrival. Very comfortable king..."
"I'd give 10 stars if I could!" "I visited in September 2018 as a solo female traveler to live out a childhood dream of being on a safari in Africa and seeing a wild lion. To say that it was the trip of a lifetime is an..."
"Couldn't fault anything. The luxury tented accommodation was very spacious and comfortable. The staff were all very friendly while still being courteous and helpful. Jono our ranger was extremely..."
"Organizing my photos and videos taken 10 days ago at Bukela Lodge prompted me to write this. The resort is phenomenal. Accommodations, food, service, and beauty are beyond expectation. Our ranger..."
"My mouth actually fell open in surprise and pleasure when I saw our accommodation. Everything about Bukela is beautiful! All of the staff were as solicitous and helpful as they could possibly be. The..."
"Unique, wonderful, luxury safari experience"
"We had only 2 days at this special place and would have stayed for at least a week. The resort is stunningly beautiful - and the customer service outstanding. From the moment we arrived - we were..."
"We spent 5 nights at Bukela lodge in late May. The staff were so helpful and friendly - and highly effecient at repairing the waterpipes which two naughty young bull elephants kept ripping up.. yes..."
"The ultimate luxury safari experience. Wish we didn’t have to leave!" "Bukela is an incredible property - we felt at home as soon as we arrived, and wish we could have stayed for more than 3 nights. The dining room and viewing platform were beautiful and cozy, and we..."
"Just home from 3 nights at Bukela Lodge. This place is amazing. The experience started whilst driving to the lodge when 2 giraffes walked past our car. On arrival we were greeted by friendly..."
"Gorgeous Game Lodge with Incredible Wildlife and the Best Staff"
"My husband and I stayed in a Luxury Tent at Bukela Game Lodge in early May. We couldn't have asked for a better experience!! The staff were extremely welcoming and couldn't do enough for us. Roan..."
"We had a really wonderful time every one was happy and helpful, we enjoyed seeing all the animals our room looked out over a water hole. Just wanted to say roads are very bad so if you're in a hire..."
"We had three nights here at the end of our holiday. We stayed in one of the tents which was perfect. It had a great view, a comfy bed and felt very cosy during one wet and windy night. The outdoor..."
"an hours drive from port Elizabeth just off the N2 you drive through electronic gates and then 8km down the very bumpy road to the lodge which is situated in the middle of the reserve. on arrival we..."
"This is an outstanding property with fabulous accommodation and an abundance of wildlife. Unfortunately the service and food quality make this a very disappointing experience. This lodge is not..."
"Memorable Stay - perfect for couples"
"A fabulous experience - we stayed in a lodge which was very spacious and well equipped with plenty of toiletries provided. The staff were so helpful - nothing was too much trouble and the food very..."
"How do we begin.This was THE most amazing experience, last on my bucket list and the best. Flawless. Lodge incredible, Game drives with the amazing guide Jonno - his enthusiasm infecting us all. His..."
"It should have been magical..."
"It is very hard to write this review because firstly I never usually focus on negative experiences, and secondly I desperately wanted this to be the most magical trip of a lifetime, however, we have..."
"Bukela Game Lodge is out of this world. My wife and I have recently returned from SA - with BL as out last stop - and couldn't have wished for a more perfect end to our Honeymoon. The lodge and staff..."
"We arrived at the lodge after driving down a long bumpy road. On arrival at reception, we were asked to hand over our car keys and the staff parked the car for us. We were not allowed an6 access to..."
"All the the fantastic Reviews are exactly correct!" "Definitely the highlight of Our S.A trip this year. We stayed here for 5 nights so plenty of time for extensive and relaxed game viewing with the most personable,enthusiast and knowledgeable Jono..."
"This experience will stay with me for the rest of my life. Saw 4 out of the big 5 - no leopard unfortunately. But this is amazing place with so much game. Have got some amazing photographs which..."
"this was the highlights of our recent south Africa trip doing the garden route. We stayed in a safari tent which despite our original concerns was excellent for three nights. We had a fantastic time..."
"I've Run out of Superlatives!" "This was our last stay in a Trailfinders "Unique and Boutique" fly-drive collection. What a fitting way to finish! Many other reviews give details of the setting (glad it was a rental car for the..."
"Mixture of early morning rise and lounging by the pool"
"After turning off the main road (N2) and through the security gate, even though we were on a public road, we realised we were actually inside the Game Reserve, as a group of giraffes greeted us a few..."
"Time of our lives "
"We stayed for 2 nights and had the BEST time! The tent was incredible and the game drives were a highlight of our whole trip. Thanks to Jonno our guide who was so knowledgeable and friendly. Ty for..."
"Amazing time at Bukela Lodge"
"My husband and I spent 3 glorious days at Butel’s Game Lodge in March 2018 and would highly recommend it. We stayed in a luxury tent, which was very private, extremely comfortable and met all our..."
"The best part of a wonderful trip ????????" "Wow! What a place! We loved every minute. This was our first visit to to a game reserve and we weren’t disappointed. From the word go the staff were welcoming and extremely friendly , the..."
"Ended our Garden Route trip with 2 days here. Bukela Lodge is a 7.5km ride down a rough road and the final part of the track is very uneven and rutted. Be aware if you have low clearance on your..."
"Lovely small game lodge. We stayed in what they call a ‘tent’. This tent had solid polished hardwood floors a sitting room a bathroom en suite with large stand alone bath and indoor shower you could..."
"Our stay at the Bukela Game Lodge was the highlight of our trip to South Africa. 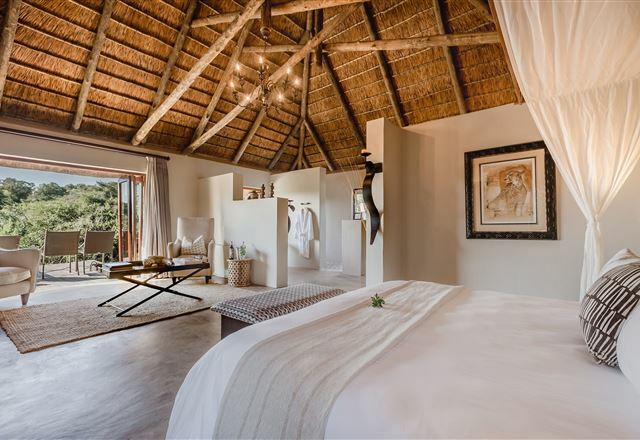 When you consider the quality of the accommodation, the food and above all the game drives, nothing could be..."
"we spent 3 nights at Bukela Game Lodge in a luxury safari tent, it was beautiful. Loved the outdoor shower and deck overlooking the valley.Everything was perfect, the staff are friendly and look..."
"The adventure really does begin as soon as you arrive to the main gate of the reserve. On the drive in through the reserve it is a couple of km's to the lodge and you can spot animal - we saw a..."
"Safari as it always should be!" "The adventure starts by getting to the lodge!! If you think, your small car won't make it, do not worry! It will. Just like our rented little Renault did... You may already spot a few animals on the..."
"Spent 3 nights here and loved every single moment, the welcome was wonderful the lodge is so beautiful with a wonderful infinity pool, our cottage was perfect beautifully set up. There is nothing I..."
"Great Place in the middle of the reserve"
"The first thing I would say when visiting any game lodge reserve park is make sure you hire a four wheel drive vehicle because getting there from the main road can be several kms on unmade roads. We..."
"This safari was just out of this world. If you are going on safari this is the place to go. There was just the two of us and we saw all the animals. Our ranger was John Luke and he was very very..."
"Such an amazing experience from beginning to end. The lodges were perfect and bed was very comfortable. Our ranger Jono was brilliant and definitely made the whole experience better, his knowledge..."
"Intimate Game Reserve with average food. " "We thoroughly enjoyed our first Safari at this game reserve. The Ranger was extremely knowledgable and we were able to see all the animals available. The property is small, accommodating 18 guests at..."
"Visisted in November and we had and amazing visit. On check in we were made very welcome and our host advised us that animals including elephants came to visit the lodge. We she was true to her word..."
"Fabulous place. Great comfortable accommodation in private chalet with private facilities lounge outdoor deck. Comfortable beds indoor and outdoor shower Guides/rangers very good knowledgeable Jean..."
"I can highly recommend the Bukela Game Lodge. It is perfectly in the middle of nowhere and all you can hear at night are the animals. We had a luxury tent which was a great experience. The bathroom..."
"Magical! - Beautiful lodge and excellent safari"
"Stayed for 2 nights. Our first safari. Beautiful luxury tent and lodge. Amazing views and lovely pool. Great food and service. Our guide was very knowledgeable. Saw lots of animals and 4 of the Big 5..."
"The whole experience far exceeded our expectations of a safari visit. We stayed in a "tent"- forget all your previous camping experience- this is completely different with underfloor heating and..."
"Wonderful Safari and luxury tent!" "We stayed for three nights and thoroughly enjoyed the whole experience. After a long day driving in the rain to get there, the welcome was warm and friendly. The food was great and our tent was..."
"The Lodge was nice. The only real issue we had was that we would have liked to have seen more animals ( after all that's the main reason we were there ) The other ranger/vehicle that was there as..."
"We stayed for three nights total. A completed the full 6 game drives. The welcome was warm and friendly. The staff courteous and helpful to a fault. The food is brilliant and the lodges are warm and..."
"We occupied a more formal lodge rather than the canvas offering. It is beautifully appointed and set in the bush with wild life all around. We experienced four safari trips both early morning and..."
"Simply a wonderful place to stay"
"I must confess at the outset to a bias on this review! That said, it won’t really change what I write. It’ll just mean there are even more complementary comments. The bias is due to the fact that..."
"We stayed 4 nights at Bukela for our wedding anniversary and loved every minute of it. We had never experienced a safari so had no idea what to expect. All the staff were so welcoming and could not..."
"3 nights. Overall superb. Set in a remote, huge, tract of land, it's well worth the visit. 4 huts and 2 tents on site so max guests will be 10-12. Game drives are super in early morn for sunrise and..."
"My wife and I stayed at Bukela Lodge for 3 nights while on honeymoon and had a brilliant first-time safari experience. We stayed in a very comfortable luxury lodge with a Jacuzzi bath and good..."
"We visited Bukela at Amakhala as part of our Cape Town/ Garden Route/Safari honeymoon. The welcome was very warm and this was made greater by the small intimate size of the hotel and encouragement..."
"We stayed here at the end of our honeymoon. We really enjoyed the experience. The lodge was lovely with gorgeous rooms and a nice communal space. Janco was our ranger and he was brilliant. He was..."
"We stayed for three night and had six game drives - our excellent ranger, Wonga, even managed to find lion footprints on the track in a misty morning so that we were able to observe four lions..."
"Fantastic few days with my family. The game drives were fabulous. We couldn't believe that we saw so much wild life so close up. The rooms are amazing. The staff are so helpful and friendly and the..."
"Wow - the service, rooms, staff and safari - the whole experience was brilliant. Our guide (Janco) on our game drives found us all except the leopard and got us close to the animals wherever..."
"My husband and I spent 3 nights here. 14th June 17 - 17th June 17. This was the first stop of our honeymoon and it was AMAZING!!! We arrived at dinner time on the Wednesday and had a lovely meal at..."
"We spent 3 days here at the beginning of July. Our guide each day was Jonathan. He was absolutely brilliant. Each drive was different and he was so knowledgable about animals, birds and all the..."
"Fantastic safari experience with beautiful accommodation"
"We spent 3 days in April/May staying here. We had the same guide each day (Lucky) - who was full of knowledge about all aspects of the reserve and not just the animals. 2x3 hour safaris each day with..."
"We stayed in one of the safari tents for four days on our honeymoon. We had the most amazing time. I think this is one of the few places on safari where you aren't fenced in which means your safari..."
"An absolute gem of a find. Lodge was breathtaking, food out of this world, and our game drives were unbelievable. Our ranger Janco pulled out all the stops to give us a memorable experience. The..."
"Oh my day's, what a place!" "We arrived after around an hour and bit drive from Port Elizabeth airport, shown to the most amazing lodge ( lodge number 1 ) which is very close to the watering hole and we were lucky to see lots of..."
"Stayed for three nights. Easy transfer time of less than an hour from Port Elizabeth, we had a private transfer by Ilios who were excellent throughout the trip. This was our first visit to a game..."
"Wish we could have stayed longer"
"Had a great time, would definitely recommend. One of us is vegetarian and the other is vegan. The staff went above and beyond to accommodate our every need, dietary wise or other. The game drives..."
"We came here as part of our honeymoon for 3 nights in Bukela lodge and we were blown away from the minute we arrived. The staff are incredible- every single one of them. We were treated so well here..."
"Incredible 3 day safari experience!" "The Bukela Game Lodge and the safari experience at Amakhala were absolutely incredible and could not be faulted. We stayed 3 nights on our honeymoon which included 6 game drives and were treated to..."
"really easy drive from P.E. Warm welcome from friendly faces. Brilliant food and drink, communal dining but not a problem at all as everyone is talking about the game drives. We highly recommend..."
"Boutique game lodge in a smaller game reserve where the Rangers really care about the animals. The Rangers were informative and friendly but did not crowd the animals. The lodge is beautiful with..."
"This had to be the icing on the cake at the end of a fantastic trip to South Africa. Everything was perfect from the moment we arrived for our 3 day Safari. Personal attention given due to the fact..."
"Fantastic - they even changed a flat tyre on my car!" "Stayed 2 nights at the end of 2 week garden route drive in a double suite. Suite was spacious and comfortable. Game drives were good - although believe what they say about the weather - we arrived..."
"We had the most wonderful 3nights at this Lodge. Exceeded our expectations in every way. Game drives were superb and the ranger Jono certainly knew his stuff. Great staff and always friendly and..."
"We stayed in a safari tent which was very well equipped, especially enjoyed the outside shower! Temperature in the tent fluctuates and the air-con unit was not really big enough to cope but that was..."
"The staff were very welcoming and everything was ready on arrival, having our first game safari that afternoon. Evening meals with the other guests ( there were only 12 of us) enhanced the visit. We..."
"Had a three night stay here after driving the garden route from Cape Town. Warm friendly welcome and stayed in a tented lodge. This was unlike any tent I've ever seen! Beautifully furnished and so..."
"Wonderful start to our tour of South Africa"
"We thoroughly enjoyed our stay at Bukela. From the moment we arrived, Sanet and her team made us feel very welcome. We stayed in one of the luxury tents, with everything available for our comfort..."
"Stayed in one of the lodges which was luxurious and had just about everything we could possibly need. The staff were very helpful and attentive. Brunch was excellent, though we felt dinner was..."
"Small and wonderfully luxurious way to see animals in the wild. Individual lodges with every comfort provided. Dining was as a group (there were 12 when we were there) which was most enjoyable. Very..."
"The accommodation at Bukela Game Lodge was first class. We stayed in one of the luxury tents for three nights. The site facilities and staff were also excellent. Our ranger did his upmost to ensure..."
"The accomodation at Bukela Lodge was first class. We stayed in one of the luxury tents. The facilities and staff were excellent. Our ranger did hid upmost to ensure we saw as much wildlife as..."
"Wonderful 3 nights here at the luxurious bukela lodge. Warm welcome from staff who welcomed us with a fab braii and african cultural evening of music and tribal dance. All staff wonderful and..."
"Honeymoon - everything we wanted and more!" "After a full day of travelling we arrived at the fantastic Bukela lodge and were promptly greeted with a brief but informative tour of the grounds and refreshing drink. The site itself compromised..."
"Third stop on our South African adventure"
"Stayed here for 3 nights. Huge room with a view of a watering hole where we saw wart hogs and kudu coming for a drink. There is a small pool, which is rather refreshing to say the least. Comfy..."
"We found Amakhala to be a really delightful place,everything was done to make our stay perfect.We stayed in one of the Safari Tents,quite luxurious,with huge bath,outdoor shower,and massive bed,sofa..."
"We visited Bukela lodge for our honeymoon. We found the accommodation very nice and the safari trips were excellent. However, we were disappointed in a couple of things. Firstly, we were promised..."
"Fantastic lodge with brilliant staff and a perfect place for peace, tranquillity and game drives. Wella1 was incredibly helpful and Janco, our game drive guide, most obviously lives for his animals..."
"Wonderful stay at Bukela Lodge"
"We had immediately a very nice feeling once arriving at the lodge. Reality was better than pictures!! For us was a relaxing stop over during our road trip from Cape Town to Durban. Very welcoming..."
"We spent 3nights in Bukela lodge at the end of our honeymoon and it was truly the highlight of our trip. The lodge and safari drives were just brilliant and our ranger Vuyani was so knowledgeable and..."
"oasis close to Port Elizabeth"
"Bukela Game Lodge is a great option close to Port Elizabeth, particulalry when you are not in the position to visit one of the big game parks. Amakhala Game reserve is a small but aceeptable..."
"Simply a fantastic safari experience that really does show you the animals in a 'wild' state without being under threat or caged in. The accommodation was fantastic with proper showers and a small..."
"Amazing. If I could give them 6 stars I would. Everything and everyone are out of this world. Our room with a view of the watering hole some 60 meters away where elephants drink, out decking visited..."
"We stayed for Christmas Eve and Christmas Day and it was the perfect decision to stay here! It does sound expensive initially but when you consider the beautiful quality of the rooms, the wonderful..."
"Excellent stay and the trip was made by our guide Jono"
"we stayed here as part of our holiday around South Africia, all the staff were excellent but a special shout out to Jono who made the trip for us. We have excellent animal encounters and would..."
"I was a bit reluctant of this place as it was a very expensive three days. Turns out I had no reason to be. If you want somewhere with TV's and internet connection, then don't go here. It's to be..."
"Lovely lodge and great game drives"
"Had a lovely two night stay at Amakhala Bukela lodge. I had a lovely villa to stay in with all the facilities you could ask for and more! The game drives were awesome, we saw many animals and we had..."
"3 night stay in late October"
"My fiancé and I stayed in Bukela for 3 nights in October. We were welcomed to the lodge by Tyrone and we were delighted with the lodge we were staying in which was beautiful and had a great view of..."
"Not for everyone! 3 nights too many for us. Overpriced"
"We chose this because of the excellent reviews but it was an expensive mistake. The lodge is focused solely on the game drives. The price includes two per day and food is served around these, so..."
"Not too big, not too small, just RIGHT!" "The Amakhala game reserve is the perfect safari experience and the Bukela Game Lodge ensures you stay in friendly and first class accommodations. The food and drink is plentiful and of the highest..."
"We had an amazing trip to the game reserve. The weather was windy and v cold but we were well wrapped up and the lodge had lovely fires and heated blankets on the beds. Food at the lodge was good..."
"This was our first safari and what an experience it was! The staff and accommodations were wonderful. Food was excellent. Our guide, Vuyani made sure we had a unique experience on each of our four..."
"Good but no longer great Safari lodge"
"Despite the rave reviews, we felt Bukela had seen better days. Think they know this as 2 tents have been erected to house visitors whilst the lodges themselves are updated. But not before time..."
"Amakhala Bukela is a fantastic experience"
"This is how hospitality should be done. With just 6 suites there will never be more than 12 guests at the lodge. You are completely private in your spacious suite with a genuine outside shower if you..."
"This was our first safari. My wife and i stayed for three nights and enjoyed 6 ventures out to view the animals. I think three nights was just right. Each morning and evening was different and our..."
"We stayed three nights in one of the new tents and fitted in six games drives including one on the morning we left. Everything about our stay was wonderful, from the welcome, the setting, the quality..."
"We had an unforgettable stay at Amakhala Bukkela lodge - everything was perfect from start to finish . All the staff were friendly and attentive , great food and drink and the surprise music and..."
"Just stayed here as part two of our honeymoon. The Amakhala Bukela truly is an unforgettable experience for all the right reasons. We were welcomed by Tyrone upon arrival and were given a safety..."
"This was the last stop on our honeymoon and we couldn't have asked for a better end to an incredible journey. This was the first safari my husband and I had taken and Bukela Game Lodge truly set the..."
"Unless you are used to the ultimate luxury in the world, you will be genuinly impressed and excited by your stay at Bukela. The location is fabulous, the safari feel is present, the staff is..."
"From the moment we arrived we felt like we were visiting friends. We were greeted by Tyrone who gave us the layout and run down of what to expect during our stay at Bukela. We were given welcome..."
"Bukela was wonderful from start to finish, the staff were friendly and attentive. The food was incredible and we saw some incredible animals on the game drives. The set up of the day's itinerary was..."
"This was the last leg of our South African holiday and what a wonderful place to finish. Our ranger Jancke was brilliant and the lodge live up to its adverts. It is an experience both of us will..."
"Not 5 stars as claimed, but worth it." "By the National Tourist Board, Bukela would receive no more than 4 stars and that would be good enough to make a visit. The acommodations are quite spacious and nicely a pointed but the lighting..."
"Literally in the middle of the reserve"
"The lodge is literally in the middle of the animal reserve. Easy to find but the final road is not tarred and bumpy with needle bushes on side (scratched the car). We crossed a giraffe even before..."
"This is an excellent safari lodge. Great lodge with thatched roof and wonderful log fire and underfloor heating also the outdoor shower. Great game drives with Jano who could have a laugh with you..."
"We visited Bukela for three nights with friends and it was out of this world. It's such a special place. From the moment we arrived we were so well looked after by all the staff. Our lodge was..."
"We had a perfect stay in this wonderful lodge : Everyone was from our arrival until our departure extremely friendly and helpful, the atmosphere was lkike beeing at home. Great food and drinks,big..."
"This a very relaxing small lodge with only four luxury lodges surrounded by beautiful countryside. The staff are really helpful and friendly. Our Ranger Marrisa was very friendly and knowledgeable..."
"Yes, loved this place. The lodge was camouflaged nicely into the reserve. Each individual lodge was superb. With underfloor heating (we were here in 'winter' and the heating was welcomed), stove..."
"Small lodge with only 4 luxurious rooms so you get to know the other guests. Staff are very friendly and very accommodating. Game drives were great and we got to see everything. The food was..."
"The service here is absolutely brilliant. We had great game drives with an excellent guide. The rooms are very comfortable and we stayed right next to a watering hole. We also had dinner in our..."
"we stayed here for three nights on the 4th june, we were warmly welcomed with drinks and shown to our lodge, lodges are beautiful and quite, we'd our own private deck to sit and watch warthogs and..."
"We spent 3 nights here at the start of our garden route honeymoon. We loved everything about the place. The staff were so friendly, food amazing and the safari itself was great. We saw all of the big..."
"We stayed here for 3 nights at the end of our garden route honeymoon trip. The staff were all very nice and our driver Vuyani was brilliant. The room we had (lodge 1) was beautiful with a lovely bed..."
"We arrived in Bukela for three nights as the second part of our honeymoon. I cannot rate this place enough. Neither myself nor my husband have ever been on safari so had no idea what to expect. We..."
"It was a lovely place, staff were very welcoming and the actual room was stunning. Honestly a very special place. My only complaint would be that it was offered to us that we could eat alone or in..."
"Authentic but facilities are not 5 star"
"Bukela Lodge is reached by travelling 7km along a very bumpy road.with a hire car that was unsuitable for off-rode pursuits. Be warned! We were delighted by our first sight of a family of warthogs..."
"What a wonderful three days to end our holiday"
"We ended our holiday at the game lodge and looked foreword to it all holiday. It was better than we'd hoped for. The lodge we stayed in, the staff and the game drives with Jacques were wonderful..."
"We had a good stay but I think the price quality was moderate. We stayed in other game resorts which were much better. The accomodation was moderate in comparison to othe resorts of the same..."
"Amazing end to our holiday"
"We stayed for 3 nights at the end of a two week trip and we certainly saved the best till last. The lodge is the perfect place to chill out between the amazing drives and Jacques our ranger could not..."
"Great location, great safari and great staff. " "We enjoyed a fabulous stay here in January and can't recommend it highly enough. Having just four rooms, you really do enjoy a personal service where nothing is too much trouble for Sam and her..."
"We're still on cloud nine after a wonderful stay at Bukela. I'd echo all the comments below about the first class team...and especially Jean, Kirsty, Nomi and Tamara. Special mention to Kirsty for..."
"Highlight of Our S African Holiday- Magical, Romantic and Just Amazing!Truly Memorable!" "From the time of our arrival, when we were met by Kirsty with the warmest of welcomes , hot towels and a drink(a regular feature after game drives) , to the moment of our departure, my wife and I had..."
"This was our last stop in SA and was simply amazing. Just four beautiful lodges set in the bush, friendly staff, beautiful food (and alot of it! ), and fantastic game drives. Of course, our experience..."
"Phenomenal. Jéan is a great asset"
"We spent our honeymoon in South Africa and we ended it in Bukela, saving the best for last! The food was absolutely beautiful and the room we had both inside and out was like something from a..."
"We had an absolutely wonderful 3 days at Bukela. The service was excellent, the staff so friendly, delicious food and our game driver Vuyini was the best!! We saw 4 of the big five (only the leopard..."
"we recently spent 3 nights here ,our first safari and what a great introduction the accomodation of just 4 individual beautiful lodges means that the maximum occupancy of just 8 people this inturn..."
"It is difficult to find words to describe how amazing it was. You have to start with JP, so welcoming, helpful and made us feel instantly at home. His team couldn't do enough and supplied endless..."
"Great and attentive staff, very friendly. Lovely lodge. Great food from Raymond (a jamie oliver fan !). Sandra was a fantastic ranger/safari guide. really good time. will hopefully be back in the future." "Making the South African dream a real experience"
"We have really enjoyed our (short) stay at Bukela Lodge --a wonderful place where Elza Truter and her staff make all efforts to make you feel comfortable and welcome. The rather small structure, run on a family basis, is ideal and quickly puts its guests in a real proximity with the staff and the remarkable environment. The place is indeed absolutely stunning and splendid. Both rangers and cooks did all they could to allow us to appreciate the game park and the food. For us, these two days were as close as possible to what may be imagined in terms of perfection, professionalism and human generosity. So, please extend our warm congratulations to all for making this South African dream a real experience!" "Bukela Game Lodge is a very nice place to stay and see some game. The valley of Amakhale is very beautiful and the hospitality of Elsa and Deon is very enthusiastic. We recommend the food, lodge and staff. A place to return to." "We had 3 wonderful days and nights at the Bukela Game Lodge. The lodges, the environment and the great attention of all the staff was fantastic. Alfred cooked fantastic meals and our ranger David showed us all the animals. Elsa and Dion thank you for these wonderful days."